A William & Mary student is expected to be featured in the third hour of NBC’s TODAY on Dec. 18 as part of its weeklong series “Faithful,” highlighting people learning from and teaching their faith and how their faith shapes who they are. A crew from the show came to campus Dec. 6 to interview Lucy Greenman '22 about her Jewish faith and to film the Hanukkah celebration she organized for her fellow 1693 Scholars. During high school, Greenman worked at a Northern Virginia synagogue, teaching music in English and Hebrew and running interactive prayer services for children. At W&M, she is a member of Hillel, the university’s Jewish student group, and plays the guitar and sings for the campus’ Shabbat services. She will also soon be teaching children at Temple Beth El in Williamsburg. On Nov. 8, W&M News published a story about Greenman and her faith, just over a week after 11 people were murdered in a Pittsburgh synagogue. A producer with TODAY saw that W&M News story and contacted University Communications to be connected with Greenman. "I feel very lucky to have had the opportunity to talk about my faith and community with the TODAY show, especially in the wake of such a devastating tragedy,” said Greenman. “I hope that others can relate to my story and appreciate the need to share light and love with friends of all faiths in times of hardship." 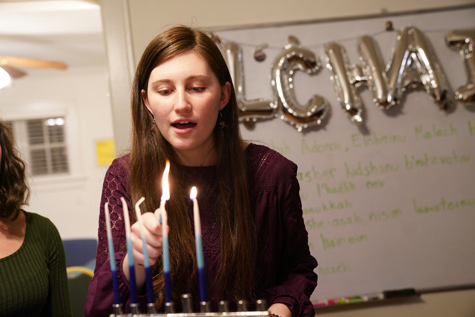 The crew interviewed Greenman at the Shenkman Jewish Center, which was dedicated on Nov. 14, and shot footage of her elsewhere on campus before joining Greenman in the evening at the Murray House. About 20 students — current 1693 scholars and their friends — attended the Hanukkah event, along with Program Director Dan Cristol and Associate Director Kim Van Deusen. The participants danced, played dreidel (with dreidels made on a 3D printer at W&M or sent to campus by the mother of one of the 1693 Scholars) and enjoyed a feast that included homemade latkes, jelly donuts and pizza. With silver balloons spelling out the Jewish toast “l’chaim” — meaning “to life” — floating behind her, Greenman explained the history of the holiday and led a song while lighting the menorah. This isn’t the first time TODAY has been in Williamsburg: 10 years ago, the show broadcast live from Colonial Williamsburg as part of its pre-election coverage. TODAY airs locally from 7 to 11 a.m. on WAVY-TV 10.